Key sector figures have urged the government to continue with its apprenticeship reforms following Thursday’s Brexit vote – and warned of the consequences if it doesn’t. 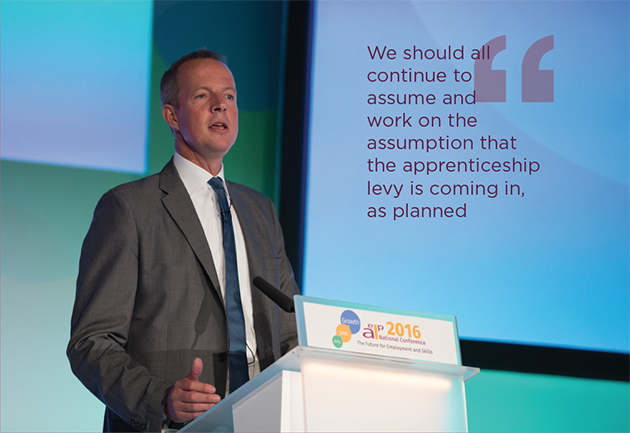 The vote by the British public to leave the European Union came after a speech by skills minister Nick Boles on June 13 raised concerns that such a verdict could kill off the apprenticeship levy. It has already led to the resignation of prime minister David Cameron, on Friday, and a mass exodus from Labour leader Jeremy Corbyn’s shadow cabinet on Sunday. Mark Dawe, chief executive of the Association of Employment and Learning Providers, was among those who argued it was now more important than ever to press ahead with its apprenticeship plans. Mr Dawe also stressed the need for “clarity” from the government on its levy plans. Chris Jeffery, non-executive director for independent training provider Skills Group, reiterated Mr Dawe’s call for clarity. While she said it could be a “long time before you see the impact” of the referendum vote, she warned that “any delay regarding the detail is only going to frustrate providers even more and employers as well”. Their views were echoed by Professor Alison Wolf, who made the case for an employer levy to fund apprenticeship training in a report published days before the government first unveiled the charge last July. She told FE Week that “skills policy has become more important than ever” in the light of the referendum result. Professor Wolf said that if the UK decided to opt out of the free movement of labour within Europe “the need to increase our skilled, level three apprenticeship numbers will be more pressing than ever”. And Shakira Martin, National Union of Students vice president for FE, cautioned that if the levy were scrapped “we’re going to see the aspirations of so many young people wanting to get into training and work squashed”. Others have raised concerns over the impact of the Brexit vote on the ESF cash the UK receives from the EU for skills training. Sue Pember, director of policy and external relationships at HOLEX, urged the government to “stabilise their policy” around ESF-funded activities. A spokesperson for the University and Colleges Union (UCU) said that colleges received “significant funding” from the ESF, and called on the government to “act quickly to quell uncertainty and set out its plans for sustainable further education funding now and in the future”. Janet Clark, education policy adviser at the Association of Teachers and Lecturers, said that it would be against any post-16 funding cuts but added that “future funding will depend on what happens to the economy”. Brett vox pops from the AELP Conference.